Monday morning began with the packing I’d been too tired to do the night before. After getting everything together I headed up for breakfast. Katrina and Tenner were up there and I took a picture of them and Ari on the rooftop. After that, I gave Katrina my business card so she could email me. She looked at it and started laughing – it turns out she’s a lawyer in Australia. She’s a prosecutor for the government and goes after attorneys for ethical/criminal violations. It turns out that they’ll be back in Istanbul around the same time I will so we’ll see each other again. 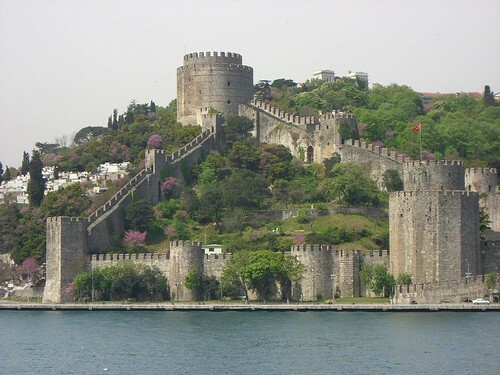 After that, I checked out and headed down to Emininou pier to buy my ferry ticket for the Bosphorus cruise. 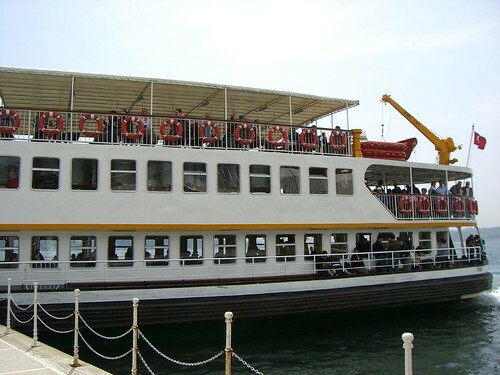 This is a city-run ferry that takes a daily run up the Bosphorus, which is the river that runs between the Asian and European sides of Turkey and empties into the Black Sea. It’s only about 12 lira for a 90 minute ride and is a great value. Robert and his family were already in line when I got there and saved me a seat on the upper deck. We were sitting next to an older couple from Sydney, Australia, who were extremely nice and told us about their upcoming trip to Greece. It was a great outing! The day was absoluely beautiful and the sea breezes felt incredible. 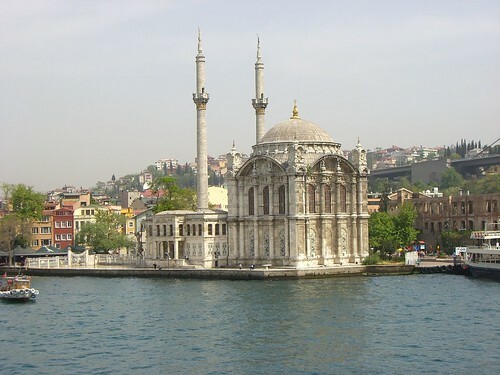 The coastline was dotted with wealthy suburban homes, the occasional mosque (cami) and a few other historical sites, such as the Dolmabahce Palace. The Asian side is much greener and more residential than the European side but both were extremely interesting to watch. I left before the last stop (you have the option of getting off at the last stop for 3 hours and eating lunch, then returning by ferry) because I wanted to get my luggage over to the train station since I was leaving later. Therefore, I took a 65 minute bus ride back to the city center – it was a long trek but was a fascinating look at the non-touristed parts of the city. I watched 2 teenage boys exchange greetings by kissing each other on the cheek (which is also common in other countries like Spain and Italy), and had to laugh at the thought of 2 American boys doing that. Three teenage girls sat across from me and were very affectionate with each other – much more so than American girls would have been. There are other differences in our cultures – for example, you can sit for hours here (and many other places in Europe) in a cafe or restaurant and no one will rush you out the door. No one brings you the check until you ask for it. It’s a much more relaxing way of llife over here. After breaking free of my carpet/restaurant buddies, I headed back to Emininou and grabbed a ferry to Haydarpasa train station on the other side of the Bosphorus. It’s amazing how cheap public transportation is here – the ferry ride to the train station only cost me about .75 cents. After arriving in Kadikoy, it was a 5 minute walk to the station although it seemed like longer. The pier was lined with older men sitting there doing nothing and every single one stared at me as I walked by. As I said before, Turkish women don’t generally walk by themselves so I guess they were surprised to see me without someone accompanying me. Haydarpasa train station is gorgeous – very ornate but in a different style than most Turkish buildings. It was a gift to Sultan Abdulhamid II from his ally Kaiser Wilhelm II in 1906. I found the left luggage locker and stowed my bags with the help of a local who translated the instructions for me. My train didn’t leave for another 5 hours, but I didn’t have much stamina so I opted to find a restaurant close by and eat dinner. It was a good choice – the meal was excellent. Chicken and vegetables and rice served in pita bread. Interestingly, I have not had a bad meal in Turkey since I got here. The rest of the time I read and planned more of my trip. At 10 pm, I boarded the train and was taken to my very own sleeper compartment – it was so cool! It has a cute little bed with bedding that folds out and a little sink – I felt like I was on the Orient Express in the middle of an Agatha Christie mystery. I stayed up for awhile but the bed was calling my name and I soon went to sleep. This entry was posted on May 8, 2007 at 1:27 pm	and is filed under Ankara, Bosphorus cruise, Haydarpasa Train Station, Turkey. You can follow any responses to this entry through the RSS 2.0 feed. You can leave a response, or trackback from your own site.